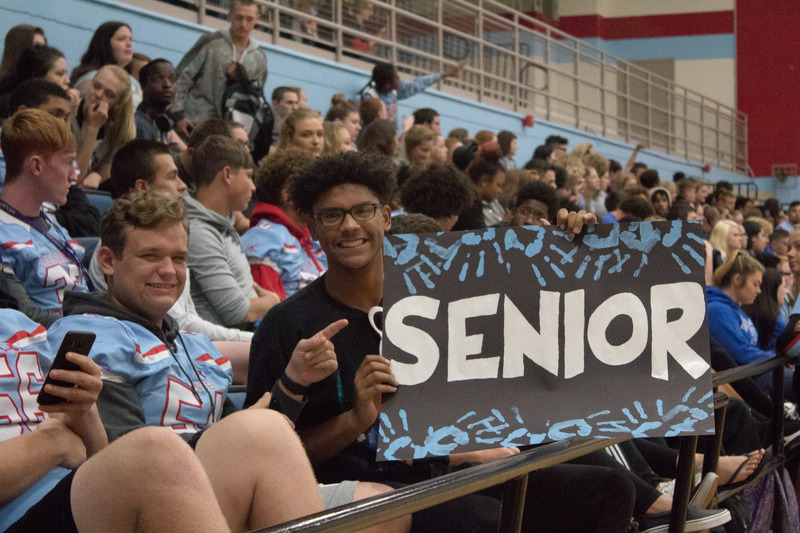 A special pep rally for the last regular season football game against rival Marlington sent the excitement level at AHS to new heights. The Culture Club, consisting of Ms. Brown, Ms. Holub, Ms. Montavon, Ms. McClellan, Ms. Breedon, Ms. Jackson and Ms. Armstead, came up with the Halloween-themed games. Excitement filled the air as each class cheered their team in the games. The first game was the pie eating contest. Without using their hands, each contestant had to eat their way through a pie, searching for a spider. The freshman team dominated after finding the spider first. The next game was the pumpkin relay race. Each contestant had to run across the gym with a pumpkin between his or her legs, then tag the next person on their team. Though the teachers made a respectable showing, it was the juniors who proved themselves in this game. The last game was a mummy wrapping contest to determine which class’s team could wrap someone in paper the fastest. It was a close contest between the sophomores and seniors, but after deliberation, judges decided the sophomores won. The support for the football players really flowed through the whole gymnasium. Everyone was pumped for the game. Coach Whiting and the team captains spoke. Howard Frazier, Duce Johnson and Austin Lilly said they appreciated the support. Captain Marcus Davis led everyone in a chant. Cross Country athlete Dylan Bailey was also recognized for his spectacular season. He placed sixth in the Division I district meet the week before. “Win or lose, I’m proud to be an Aviator,” said senior Mallory MCcreedy. “The pep rally was a great way to get us all pumped for the game,” said senior Mackenzie Barnett. Friday’s was the second pep rally of the fall season. The first was before the Homecoming game. It was also planned by the Culture Club, with Mr. Oberhauser announcing. 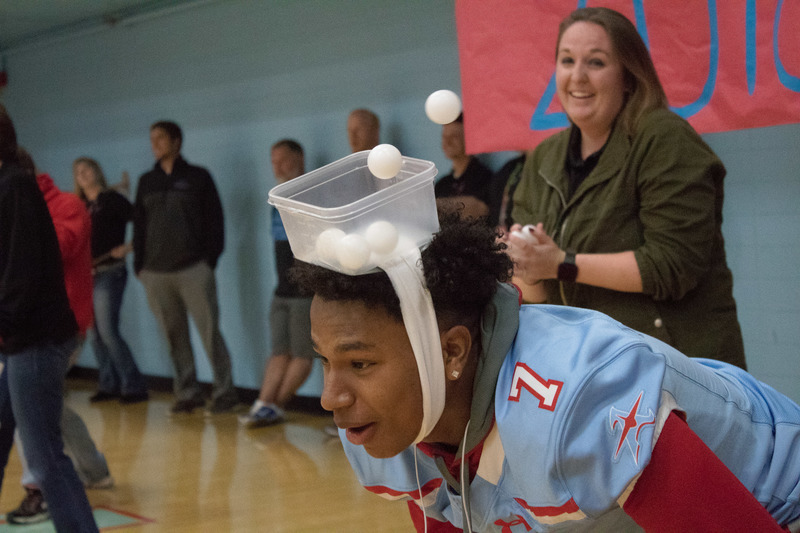 At that rally, the freshmen won the caterpillar race and juniors won “Cup Head Ping Pong.” Juniors also won the pantyhose bowling game, while the sophomores claimed the title for the Hula Hoop chain. 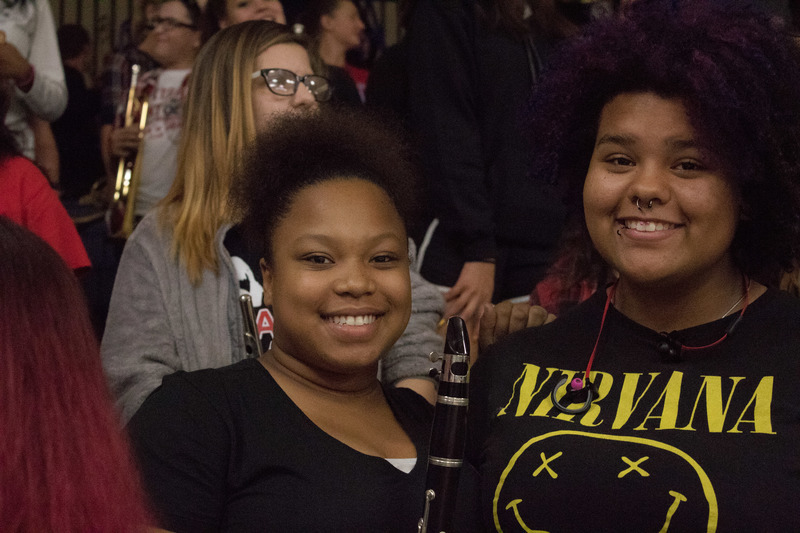 The pep rally followed Spirit Week for the Aviators. Pajama Day kicked off of the week, followed by Support Another Sport Day. “I just love getting the chance to support my friends in their sports by wearing their jerseys,” said sophomore Corinne Phillips. Wednesday was Celebrity Day, Thursday was Throwback Day, and Friday was Wear Your Class Color Day. Freshman McKenzie Schoolcraft dressed as actor Neil Patrick Harris for Celebrity Day. “I just love everything he does and the positivity he brings,” she said. Freshman Unikka Threats said: "I really like the way people dressed in the Seventies, so when I got the chance to dress the way they did, I took it."